"He & his staff are amazing & loving." 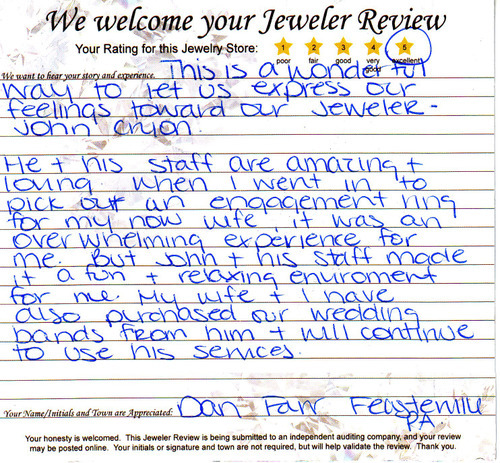 This is a wonderful way to let us express our feelings toward our Jeweler- John Cryan. He & his staff are amazing & loving when I went in to pick out an engagement ring for my now wife, it was an over whelming experience for me but, John & his staff made it a fun & relaxing environment for me. My wife & I have also purchased our wedding bands from him & I will continue to use his service.